Manny Pacquiao’s trainer, Freddie Roach, has a theory on why the usually verbose Floyd Mayweather Jr. has been subdued during the build-up to Saturday’s hotly anticipated welterweight bout at the MGM Grand. “I am wondering if he (Mayweather) is going to show up, I really do,” the bespectacled Roach told reporters with a smile before the two boxers held their final pre-fight media conference on Wednesday. 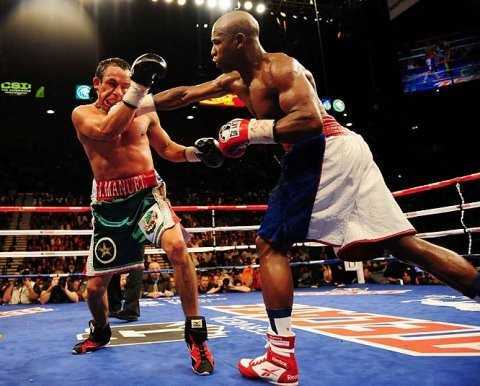 Mayweather vs. Marquez. 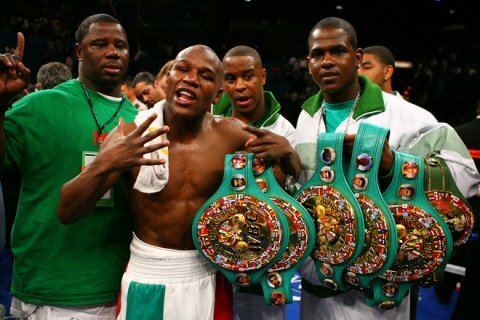 Floyd Mayweather Jr.
American Mayweather, nicknamed ‘Money’, is undefeated as a professional and will step into the ring on Saturday as the favourite in his bid to improve on a perfect 47-0 record. Known for his flamboyance and shrewd business acumen, Mayweather typically indulges in plenty of trash-talking to promote fights but has adopted a low-key approach ahead of a bout that is expected to be the biggest-grossing of all time. “I’m glad I was flashy and outspoken when I was younger but I’m close to the big 4-0,” said the 38-year-old. “I don’t have to bash anyone. I know what I can do. Roach readily admits that he has studied more video tapes of Mayweather than other fighter and felt that he and Filipino southpaw Pacquiao were now “100%” ready to hand the American his first ever defeat as a professional.